Greetings from all of us at MGVS! We are near to end of this year 2015, and we at MGVS are looking forward to take a break in December for the winter vacation. But it is also time for us to remember all our friends and supporters for their help and prayers throughout this year. It is our pleasure to share the progress of the MGVS with all of you. MGVS is near to completing our three year project based on Outcome Mapping (OM) “Culturally Enriched Networks for Sustainable Change”. MGVS funding partner TEAR Australia organized an Evaluation in October, and we are waiting for the report. I was talking with evaluator, and she was impressed to see positive changes that MGVS able to bring in the life of rural people. The condition of the women and girls has improved; women are getting their rights. 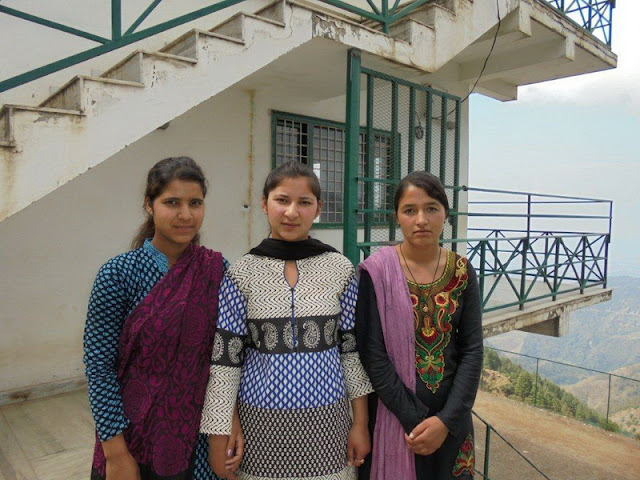 Most of the girls are going school and some are going for higher education. The girls’ performance in school is better than boys. This is the impact of the girls resilience program that we are running with 180 girls. We hope you will enjoy reading about some of the highlights of our work during this year below. MGVS Kaplani High School is making progress every year. After receiving recognition from Government Education Department for the 9th and 10 grades in 2013 -2014, the first group of our 10th grade students appeared for the Board examination in March 2015 as regular students. The result was excellent, thirteen students (8 girls and 5 boys) out of fifteen passed their exams. Three girls got first Division, Six students (3 girls and 3 boys) got second division and four students (2 girls and 2 boys) got third division. It was a great result that our students achieved this year. Another result of the Government recognition is that the number of students in the school has increased from 71 to 84 for the 2015-2016 school session. MGVS is still running Donk Primary School in Donk village for very scattered families of the Pantrani and Donk villages. Thank you so much for your continued and invaluable support and for joining us in this effort to improve life for marginalized people living in remote areas of Garhwal. 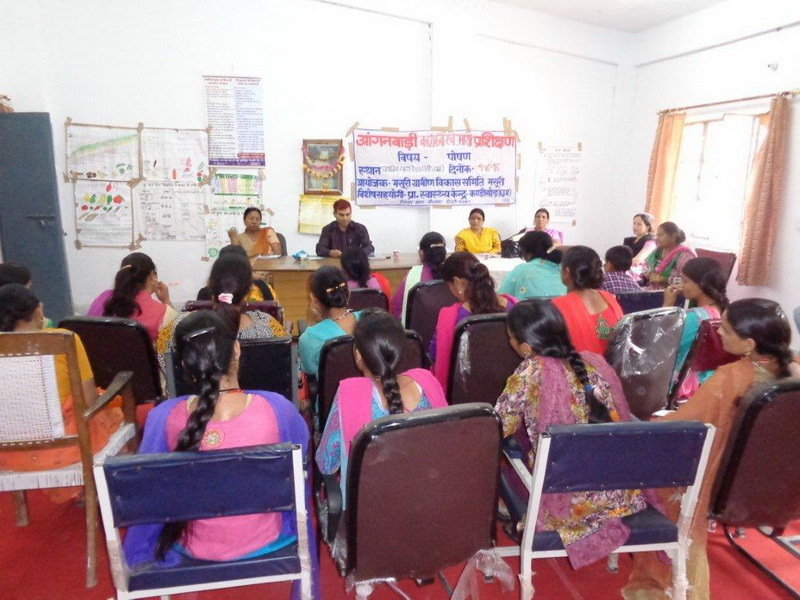 MGVS organized a one day training workshop for women Self-Help Group (SHG) officers at Block Office, Kandisaur. The training held on 12th February 2015. All together 20 women officers of 11 SHG’s attended the training along with MGVS field staff. MGVS coordinator Mr. Surender Singh also participated in this training. The Block Development Officers, Mr. Dalbeer Singh Bhandari along with Assistant Block Development Officer Mr. Vijendra Lal were the resource persons for the training. 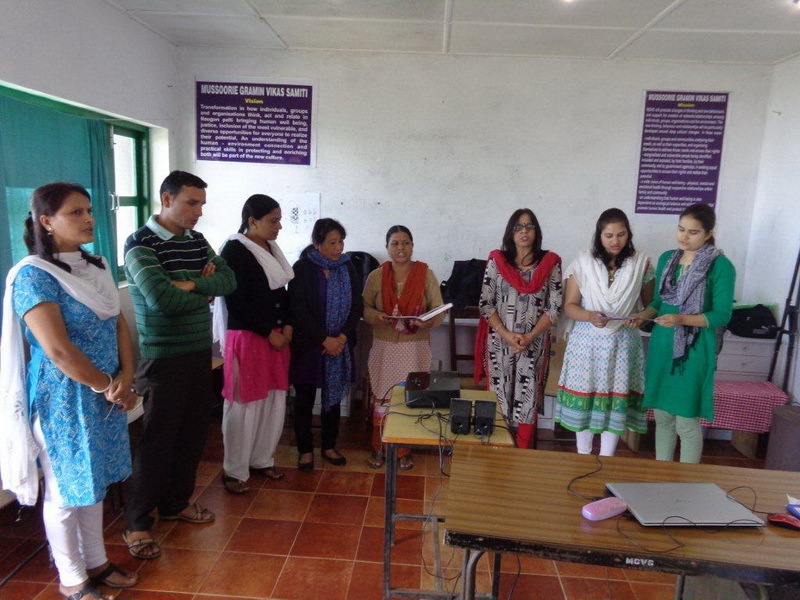 The objective of the training was establish a working relationship of the SHG’s with Block Development office and with the officers. 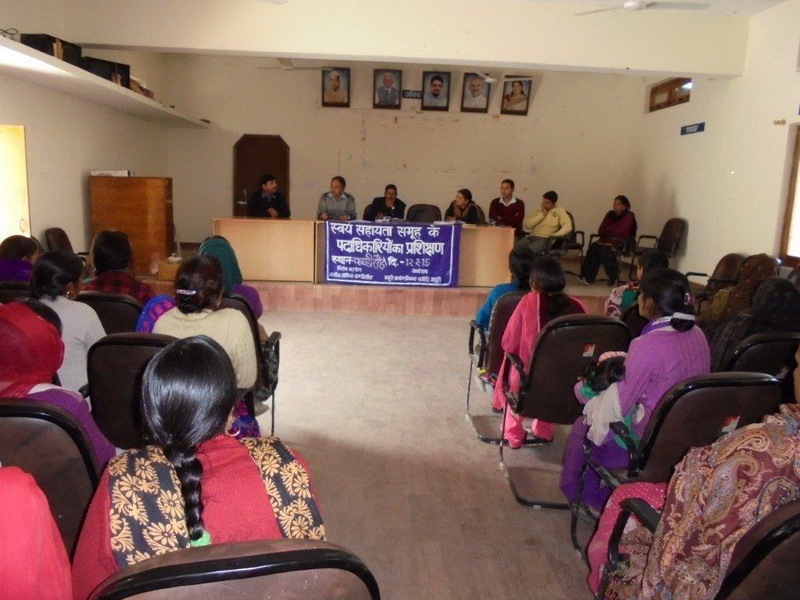 The Block Development Officers talked about the Government Schemes available for the SHG’s at the Block Office such as “Panchsutra” (Five Rules of Income Generating Program). They also talked about the benefits of the SHG’s for the development of their community and themselves. It was very successful training for the women officers as they had an opportunity to interact directly with the Block Development Officers. After the training there was time for women officers to ask questions to the Block Officers regarding their group activities. 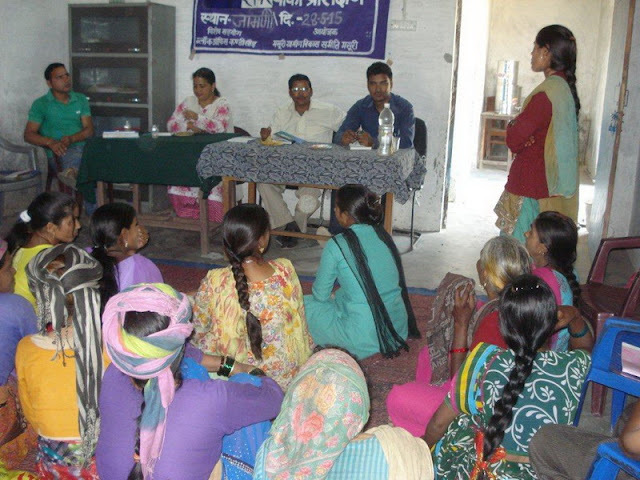 On 28th May 2015 MGVS organized a training program on Government Schemes in Jamini Village for the villagers. Assistant Block Development Officers Mr. Vijender Lal and Mr. Satendra Rana, Assistant Development Officer, Cooperative attended the training in field. The officers talked about how the women groups can get benefits of the government schemes, and how to file a RTI (Right to Information) if they are not satisfied with the work of the government department in their village. There were 5 women from Koliyana village, 7 women from Mistriyana village and 25 women from Jamni village who attended the training program. It was a happy moment for the villagers as they have met the Block officers in their own village and were able to interact with them directly. 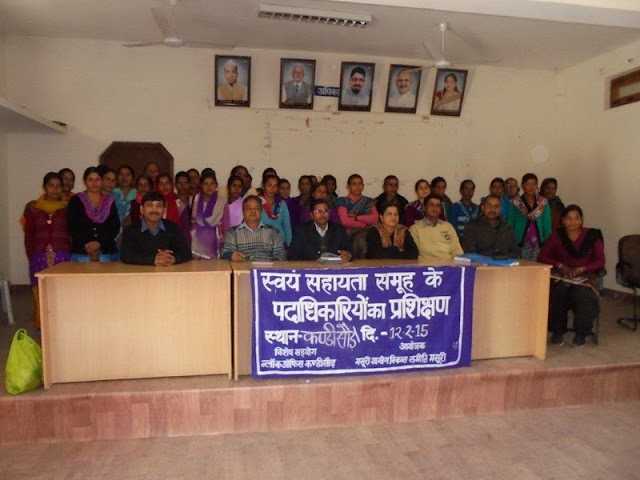 On 20th March 2015 MGVS organized a Post Panchayati Raj (Local Self Government) training for newly elected Panchayat Members (Pradhan, ward Members and Block Development Committee Members) of the Naugun Patti at Block office Kandisaur . Mr. I.S. Chauhan, Assistant Development Officer, Panchayat and Mr. R.S. 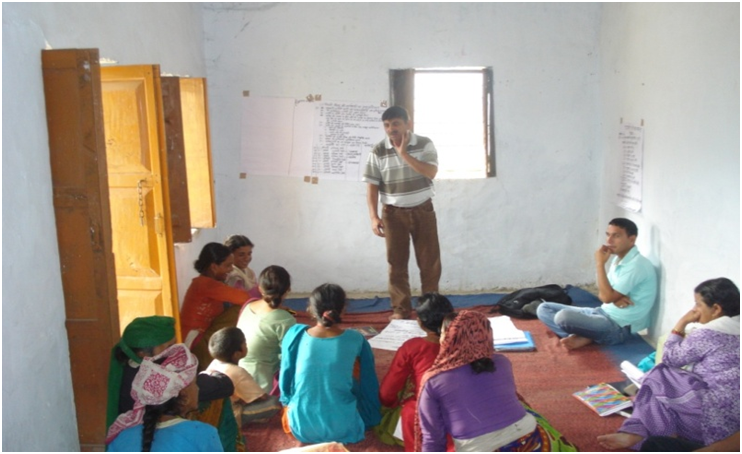 Chauhan , Village Panchayat Development Officer were the resource persons for the training. 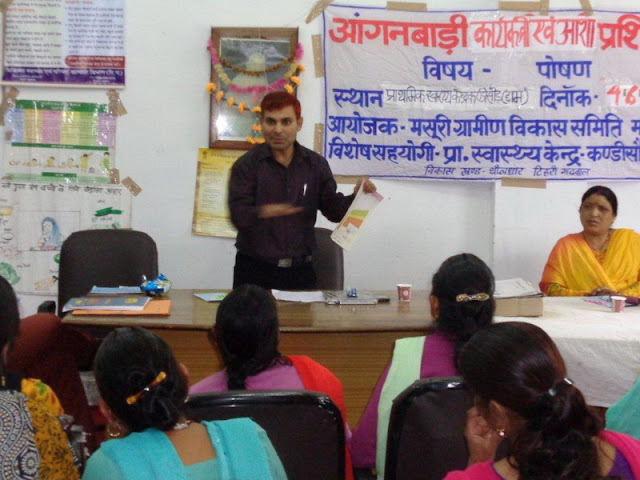 The purpose of the training was to introduce New Panchayat members to Block office and to establish a working relationship with the Block office. To be an effective Panchayat it should have a strong relationship with their Block office. There were 45 Pradhans, 25 ward members and 4 BDC members present. Three Mother and Child Festivals were held in the Naugun Valley in 2015. MGVS helped the Panchayats to organized these festivals in order to provide regular vaccination to under five children, Pre-natal and Post- natal Care to Mothers, and health awareness to the villagers. Three Panchayats Ghiyakoti, Gair and Kyarda have organized these festivals in their village on 7th May, 14th May and 15th July 2015. The Government health workers, ANMs (Auxiliary Nurse Midwife) ASHAs (Accredited Social Health Activist) and Anganbadi (preschool) Teachers attended all these festivals and provided the health services. The Pradhans of all three Panchayats have also participated in these festivals and shared the cost of the prizes for the healthy children . A total of 55 mothers and 76 children attended these Mother and Child festivals. The Anganbadi Teachers have given demonstrations on nutritious foods such as Kichiri (a dish with mixed rice, pulses, vegetables and oil) for under five children with the local available food material. Height and weight were measured for each child. Prizes were given to healthy children who have completed all the vaccinations and are growing well according to the road health chart given by the Health department. 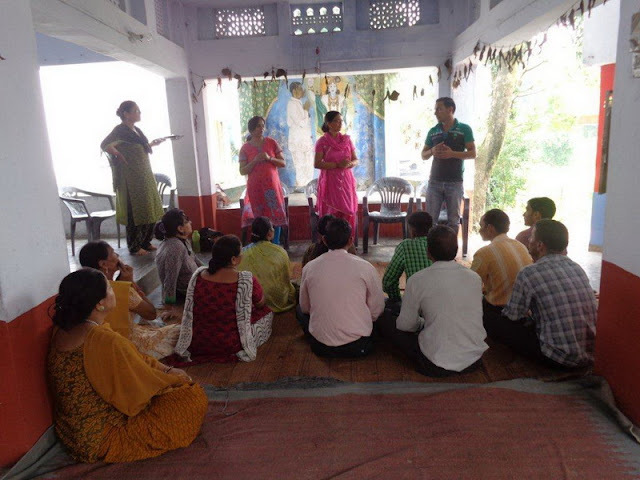 On 4th June 2015, MGVS organized a follow up training workshop for Anganwadi teachers and ASHAs at the Primary Health Center, Kandisour. Resource person for the workshop was Dr. Uniyal , Govt. Health Officer, who is looking after the Govt. 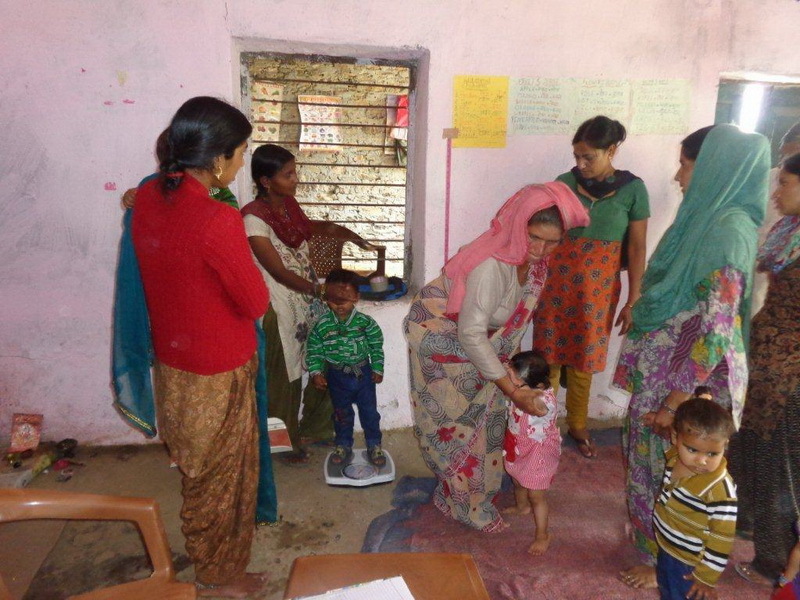 health program in MGVS working area. The topics of the workshop were (a) Child Nutrition, (b) Child Growth, according to Health Chart, (3) Hospital Delivery, and (4)Family Planning. Rajni Ramola (ANM) gave information on Vaccination and Personal Hygiene. Mr. Subhash Ramola, National Rural Health Mission officer, talked about Government Health Scheme for the villagers . 13 Anganwadi teachers and 5 ASHAs attended the training workshop. Doctor Uniyal is providing nutrition training. MGVS Staff learning by games about family welfare. On 6th August 2015, a one day Panchayat Raj Training workshop was held for the Women representatives of the Panchayats (Local Self Government) at Block Assembly Hall, Kandisaur. The Assistant Development Officer Panchayat, Sh. I. S. Chauhan & Assistant Block Development Officer Sh. Vijendra Lal were the resource persons for the workshop. There were 2 women Pradhans and 7 women ward members who attended the training workshop. The purpose of this workshop was to enable women representatives to play an effective role in their Panchayats. There is 50% reservation for the women in the Panchayats but women still depend on men for decision making. On 18th August 2015, MGVS organized an exposure visit for Pradhans (President of the local self government) from Naugun Patti. 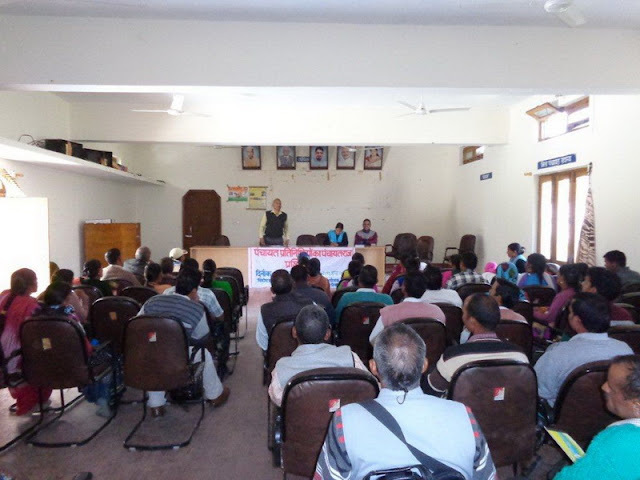 The exposure visit was organized to see some of the active Panchayats in RLEK organization’s working area in Dehradun. 8 Pradhans (two women and 6 men) joined the exposure visit. First of all, the group of Pradhan visited the office of the RLEK organization and met the officers who are working with Panchayats and learned about their work with the Panchayats. After office visit of RLEK organization the group went to see the Gram Panchayat of the Prohitwala and met the women Pradhan, Ms. Meenu Chettri and members of the Panchayat. The Pradhan Meenu Chettri shared her experience about Panchayat and her experience with the Government offices and Non-Government Organizations. She mentioned that it is important to keep a working relationship/network with Government and Non-Government Organizations as well as with the local political leaders such as MLA( Member of Legislative Committee and MP’s (Member of the Parliament ). She said due to the above relationship, her Panchayat was able to received help from the MLA and MP’s fund, which they used in their Panchayat. She also said her priority is to establish a good working relationship with the members and with the people of her Gram Panchayat so that they can be part of the development process of their village. A good relationship with the Block Office is also very useful for the Panchayats. The group of Pradhan also visited another Panchayat, Gajwari and met one more woman Pradhan, Ms Leela Sharma. Ms. Sharma has been Pradhan for the last 10 years. During her leadership as a Pradhan, her Panchayat received award of the “Nirmal Gram” and also received award from the Chief Minister and from the President of India. She said she does all her work by herself. The group of Pradhan has also seen the development work of her Panchayat. It was a very encouraging visit for all the pradhans of MGVS working area, and especially for the women Pradhan to be self-reliant. 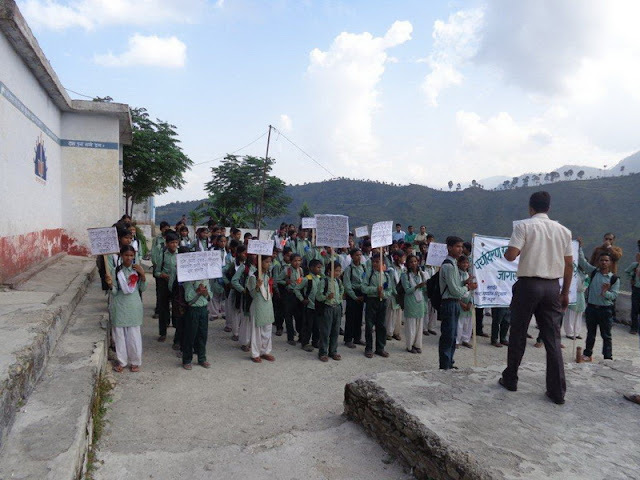 On 3rd September 2015, MGVS organized a community awareness rally with the collaboration of High School Gair. 60 girls and 40 boys of class 9th and 10th and 5 teachers participated in the rally. The purpose of the rally was to raise awareness of the Community towards their Environment, Gender Equality, rights of the disabled people, and Sanitation. 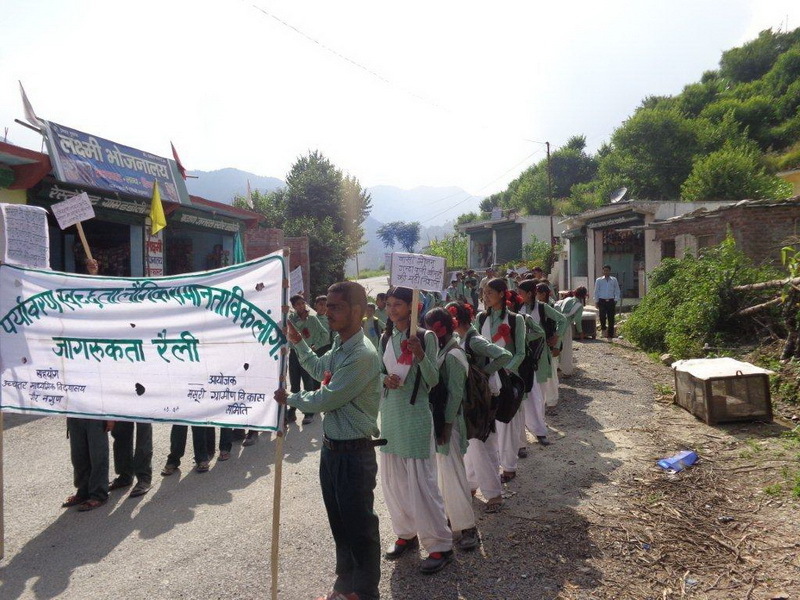 The Rally started from Gair High School and went through several villages: Lalori, Kyarda, Dadoli and Pokhari. MGVS shared the cost of refreshments for the students and cost of the banners and posters. The villagers were looking at rally with interest. 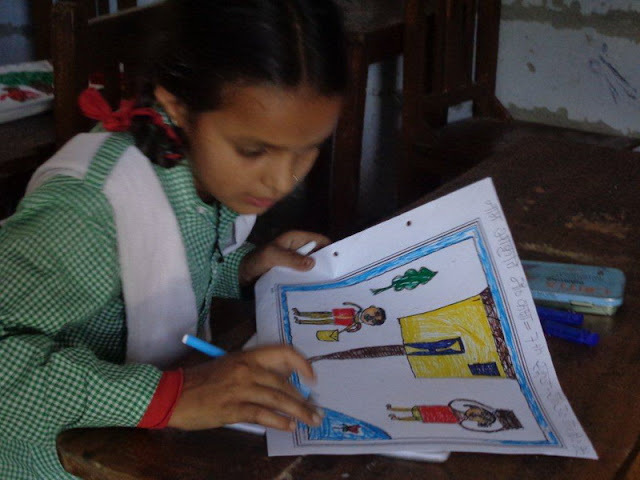 On 10th September 2015, MGVS organized a Poster Competition on Justice and Gender Equality for the 6th to 8th classes students at Gair High School. Two girls and two boys from each School, Vikol Junior School, Ghoan High School, Gair High School and Nagraja Dhar School participated in the competition.1st prize was won by Deepika Nautiyal class 8th of Gair High School. 2nd prize was won by Krishna class 8 of Ghoan High School. 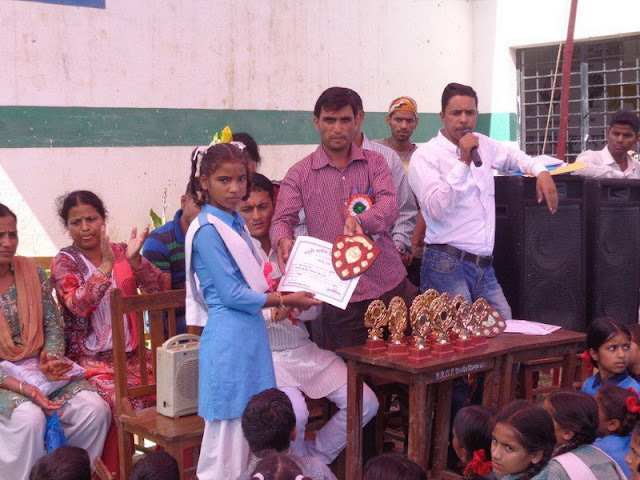 3rd prize was won by Neha Nautiyal class 7 of Gair High School and other students were given consolation prizes who participated in competition. Pradhan of village Pokhari Sh. Bachan Singh, Pradhan of village Gair Sh. Harish Raturi, Panchayat Member Sh. Ram Singh Budan were also present during prize distribution. 260 students and 25 teachers attended the prize distribution ceremony.